Abierto GNP Seguros final to match former No. 1s Garbiñe Muguruza and Victoria Azarenka. Defending champion and No. 2 seed Garbiñe Muguruza reached her second straight Abierto GNP Seguros final by making quick work of No. 8 seed Magdalena Rybarikova of Slovakia on Saturday afternoon in Monterrey, Mexico. The former No. 1 from Spain needed only 76 minutes to beat her hobbled opponent 6-2, 6-3. The victory advanced the 19th-ranked Muguruza into Sunday’s final on the Cancha Central against No. 5 seed Victoria Azarenka of Belarus, who beat top seed Angelique Kerber, 6-4, 4-6, 6-1, Saturday night to reach her first WTA singles final since giving birth to her son Leo in December of 2016. “It’s quite incredible. I’m very pleased with the way I played today. It was an important match to see how I could do under pressure against a top player,” Azarenka said during an on-court interview after her victory. 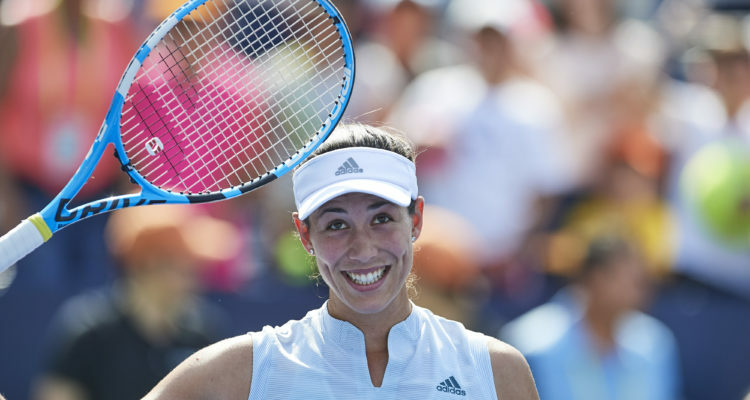 Like Azarenka, Muguruza is happy to be back in the Monterrey final, again. “It’s always a good feeling. Muguruza established her dominance during her semifinal against the 71st-ranked Rybarikova. She won 10 of the first 13 games and didn’t face a break point until three games before the end of the match. The victory put the Spaniard in the right frame of mind headed into the final against Azarenka, whom she lost to in their only meeting during the round of 16 at the 2016 Miami Open. “I feel really good right now. I played better in this match than the others this week and I’m feeling great physically,” said Muguruza, who has dropped just one set this week. Meanwhile, Azarenka beat Kerber for the eight time in nine meetings. After the two former No. 1 players split the first two sets of their two hour and 11 minute match, the 67th-ranked Azarenka jumped out to a 5-0 advantage in the final set by playing determined tennis and hitting the ball brilliantly and with purpose. She won 74 percent of her second serve return points and finished with six breaks of Kerber’s serve in 12 tries. In her last 10 matches against lefties, Azarenka is 7-3. The last time Azarenka won a WTA Tour final was the 2016 Miami Open. It completed a “Sunshine Double” for her (winning Indian Wells and Miami in the same calendar year). Both she and Muguruza will carry four-match winning streaks into their final. “I’m getting back used to playing, and I’m trying to make better decisions, better choices under pressure,” said Azarenka, who hit 37 winners to offset 32 unforced errors. While she yielded 30 winners to the fifth-ranked Kerber, the German committed 40 unforced errors. Azarenka added: “It’s all about taking one step at a time. I always knew how to play tennis, but to put it all together is always more tricky, so I’m glad that I’m able to put little pieces together in the important moments. This entry was posted in WTA Tour News and tagged Abierto GNP Seguros, Garbine Muguruza, Monterrey, WTA.